If you look at a short list of Chevy Chase�s hit films, you�ll indeed discover it�s a very short list. 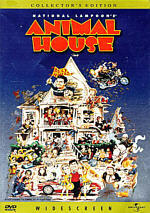 It�d include 1980�s Caddyshack, 1983�s National Lampoon�s Vacation, and 1985�s Fletch. Interestingly, Chase went on to appear in sequels to all three of these. 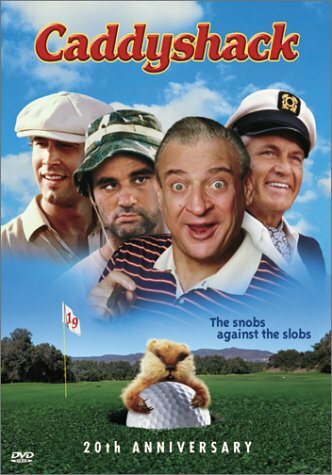 He was the only original castmember of Caddyshack to come back for its flop 1988 sequel, and he also returned for 1989�s Fletch Lives. Neither of those franchises made it past a second iteration, though it appears that Kevin Smith�s leading a third Fletch flick that won�t star Chase. 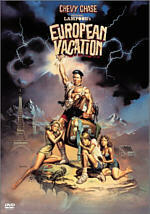 His most enduring chain is definitely Vacation, which has so far offered three sequels. None of these enjoyed the success or fan popularity of the original. First out of the hopper came 1985�s National Lampoon�s European Vacation. European Vacation assumes you saw the original flick, as it provides very little exposition to establish the characters. At the very start of the film, we re-encounter the Griswald family from the first movie: father Clark (Chase), mother Ellen (Beverly D�Angelo), and teen children Audrey (Dana Hill) and Rusty (Jason Lively). They appear on a TV game show called Pig in a Poke where they win the grand prize: an all-expenses-paid two-week trek across Europe. And there�s your plot! Essentially, European features no real storyline; it just plops the Griswalds in Europe as an excuse to show them encounter various wacky scenarios. They begin in London and then move to Paris, Germany and Rome before they finally come home. The closest thing to a plot relates to Clark�s continued obsessiveness; he wants to complete a happily family vacation no matter what the cost. However, European�s Clark lacks the same drive and fervor found in the first film. Sure, he expresses his intent to get his own way and move forward despite many setbacks - and persistent disinterest from his family - but these elements felt lackluster and forced. In Vacation, Chase made Clark a man possessed, but this one did little more than pay lip service to that original attitude. That lackadaisical tone spread to the whole movie. For the most part, European seemed to exist just to be a sequel. The first film had some spark and originality, but European felt obvious and forced. Really, Clark�s obsession influenced and united the original movie as he worked toward a nervous breakdown as various societal elements ruined his big family trip. In the sequel, Clark essentially becomes little more than the ugly American. Very few of the problems occur due to external forces; Clark causes most of them, as he seems more and more like a bumbling fool. Despite the lack of focus, European had some entertaining moments. The satirical view of British politeness could be mildly funny, and a case of mistaken identity in Germany also generates a few laughs. However, most of the humor really didn�t go anywhere. The gags didn�t seem overtly bad for the most part, but they just fell flat. Part of the problem related to the acting. As noted, Chase came across with little of the spark or energy he displayed in the first flick, and that left a big hole at the center. D�Angelo was adequate but left without much to do, while the kids created substantial concerns. We found neither of the original actors; Anthony Michael Hall played Rusty the first time, while Dana Barron portrayed Audrey. (Apparently the filmmakers wanted to keep the kids the same age for all the Vacation flicks even as Clark and Ellen aged.) Lively appeared too goofy and grating, and I actively disliked Hill. Honestly, I never could stand her, and her presence remained emotive and fussy. With that dumpling face, she looked like a Cabbage Patch Kid come to life, and her acting followed suit, as she seemed broad and whiny. Frankly, European Vacation wasn�t an unpleasant experience, but it appeared bland and unmemorable. The movie rambled through its 94 minutes with little spark or excitement, and some weak acting from the main cast didn�t help matters. I�ve seen many crummier films than European Vacation, but I still thought this one was lackluster and only sporadically entertaining. Casting note: as I watched European, I marveled at how good D�Angelo looked for her age. As it happens, I didn�t need to marvel; she was only 30 at the time! Surprisingly, Hill was less than a decade younger than D�Angelo; only Chase - who was well into his forties in 1985 - actually could have sired the girl. National Lampoon�s European Vacation appears in an aspect ratio of approximately 1.85:1 on this single-sided, single-layered DVD; the image has been enhanced for 16X9 televisions. The picture showed a few signs of age, but overall I thought it looked very good. Sharpness consistently appeared solid. One or two wider shots came across as a little soft, but they weren�t a major issue. The vast majority of the movie seemed crisp and well defined. Jagged edges and moir� effects caused no issues, and I saw no signs of edge enhancement. In regard to print flaws, some mild grain caused to most noticeable problem, as it reared its head to a moderate degree during the first half of the film. Most of the second part seemed pretty clean, however, and other defects appeared fairly insubstantial. The film offered a few nicks and occasional speckles, but these didn�t provide any significant concerns. Colors usually looked quite good. They seemed generally clear and accurate, with some vivid and bright tones as display. On a few occasions, they came across as a bit heavy, especially when we saw colored lighting, but as a whole, I thought the hues were solid. Black levels appeared reasonably deep and dense, while shadow detail appeared a bit muddy at times, but for the most part, the low-light sequences remained fairly clean. Overall, European Vacation demonstrated some modest issues, but I felt it offered a pleasing image as a whole. Also fairly good was the monaural soundtrack of European Vacation. Speech occasionally came across as somewhat thin and flat, but the lines lacked any edginess and they showed no problems related to intelligibility. Effects also seemed somewhat tinny, but they retained acceptable fidelity and clarity, and they demonstrated no issues related to distortion. Music sounded quite strong, as the songs and score were bright and rich. They featured surprisingly positive bass response and seemed pretty dynamic considering their age. I heard a little hiss and hum at times, but those concerns weren�t excessive. Overall, I found the track to seem very nice for its period and the restrictions of the monaural format. European Vacation doesn�t provide many extras, but we do find one substantial one. In addition to the film�s theatrical trailer, we get an audio commentary from actor Chevy Chase. He offers a running, screen-specific track, but don�t expect much. For the most part, Chase does little more than offer general comments about how much he liked the cast and he tells us when he thinks something�s funny. We learn a few modestly interesting comments, such as which pieces of wardrobe Chase still owns, and at one point he indicates that he previously thought European was a bad movie but this screening changed his mind. Chase�s commentary isn�t a total loss, but it provides little concrete information and features sporadic remarks with many gaps. At least he actually criticizes the film a few times, as he tells us his opinion of how Rusty was depicted. I�ve heard worse commentaries, but this was still a rather dull piece. I felt the same about National Lampoon�s European Vacation as a film. It had a few decent moments and remained watchable for the most part, but it seemed fairly bland and uninvolving as a whole. The DVD offered moderately flawed but generally solid picture and sound plus a fairly flat audio commentary. Fans of the Vacation series should be happy with this release, but those less forgiving will probably prefer to stick with the original film alone.